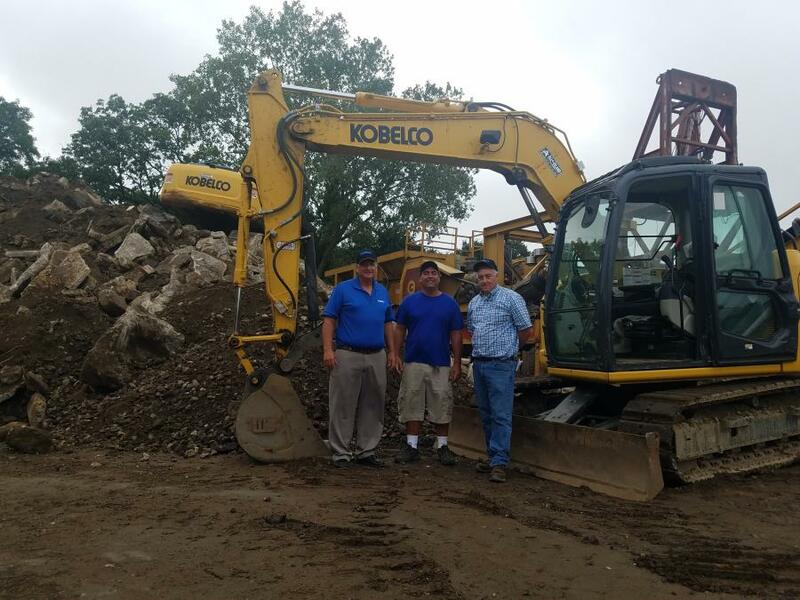 Ron Cianuciulli (C), owner of Atlas Asphalt, recently purchased a Kobelco SK75 from All Island Equipment. Pictured with him are Terry Ober (L) of Kobelco and Gary Wade of All Island Equipment. Atlas Asphalt, a masonry and asphalt paving company located in Deer Park, N.Y., has been serving residential and commercial customers in Nassau and Suffolk counties for 32 years. Owner Ron Cianuciulli's efforts are supported by his sons, Tyler and Jordan, who have recently joined the firm on a full-time basis, his sister Dena and 50 employees. Since he started in business, Cianuciulli has primarily turned to Gary Wade and All Island Equipment to satisfy his machinery needs — his pavers are LeeBoy, his rollers are Dynapac and his skid steers and track loaders are manufactured by Gehl and Takeuchi. Recently two updates to his excavator fleet were made with the purchase of a Kobelco SK75SR and a Kobelco SK200LC. "I purchase my equipment from All Island Equipment because they are priced right, and they stand behind what they sell," Cianuciulli said. "We have really had great success with the Kobelco machines. "The new Kobelco SK75SR is one of my favorite machines; I use it every day. We've been laying a lot of eight-foot precast drainage pipe and it lends itself very well to that application. "But it is not just the machines that All Island Equipment sells, its everything else that goes with it. They have everything that we need in stock. If I'm looking for a particular item like a trailer it is almost always in their inventory and we can immediately pick it up and put it to work." For more information on Atlas Asphalt, visit www.atlasasphalt.com. For more information on All Island Equipment, call 631/643-2605, or visit http://www.allislandequipment.com/.